Discontinued products for Off-Line monitoring system (GuardMagic mTF4 modules). "FidTrace Monitoring service discontinued" (1 May 2014). All customers will be need to reconnect stationary modules (FSM modules) to PowerTrace monitoring service. 10.04.2014 "PowerTrace Vehicle Monitoring service" now support modules GuardMagic FSM and GuardMagic FSL. It mean that now "PowerTrace monitoring service" is universal monitoring service for all type of objects (Mobiles and Stationary). "FidTrace Monitoring service will discontinued" 1 May 2014. All customers will be need to reconnect stationary modules (FSM modules) to PowerTrace service. After modules reconnection will be need to contact directly with us that we entered your modules in system. The simple way for monitoring fuel level (fuel volume) in fuel tanks that located near office (monitoring room). generate fuel graphs for each fuel tank. "EasyTank" software (FREE, support up to three fuel tanks). "TankMonitor" software (commercial, support up to FOURTEEN fuel tanks). Guardmagic DAFS2 is intended for connection car, light vehicle regular floating fuel level sensor to GPS-GSM/GPRS module. customer programming output voltage range. Adapter has an internal filter for smoothing signal from floating fuel level sensor. The ADAPTER is tuned and calibrated by the special service software. Such kind of adapters could be used to provide fuel monitoring on passenger cars, small truck (pick-up), or LCV (Light Commercial Vehicles) on which the use of DLLS fuel level sensors is not reasonable due to technical, or economic reasons. 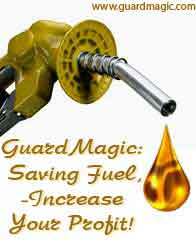 Guardmagic DAFS is intended for connection car, light vehicle regular floating fuel level sensor to GPS-GSM/GPRS module. DAFS could be used to provide fuel monitoring on passenger cars, small truck (pick-up), or LCV (Light Commercial Vehicles) on which the use of DLLS fuel level sensors is not reasonable due to technical, or economic reasons. stable noise and pulse free analog voltage output 0-8,5 V range.